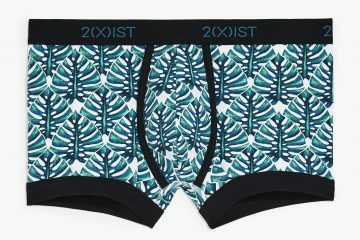 2(x)ist announces the all new Speed range. It is the new collection that bridges the divide between performance-ready underwear and fashion. Poised for action, Speed features 2(x)ist (X)-Pel Wicking Fabric, their own stretch blend that drives out perspiration for a drier, comfortable feel, plus an Original Contour Pouch within the garment’s body, which adds profile support and noticeable boost. As for dashing looks, SPEED’s microfiber, center-front logo waistband takes notice in two ways. First, a dynamic array of laser-like lines radiates across the elastic. Then, the same waist-band is dual printed with a blast of color on the interior, offering an unexpected pop from the inside to out. And for a final quick fix, bold contrasting piping ergonomically wraps around SPEED’s body for a swift, active look.SPEED is available in No-Show Brief ($24), No-Show Trunk ($28), and Jock Strap ($24).